George Graham Reviews David Wilcox's "Open Hand"
A couple of weeks ago, I reviewed the new CD by Indigo Girls, and noted that they emerged in the 1980s, riding the crest of the popularity of Tracy Chapman and Suzanne Vega, who helped to pave the way for a new spate of folk-based singer-songwriters back then. At the time, a number of major labels signed folkies, and most of them were women. One of the relatively few emerging male artists from that period to be picked up by one of the big commercial labels was David Wilcox. In 1989, A&M Records released his very impressive debut recording How Did You Find Me Here. Now some 20 years later, Wilcox is out with his 15th release, less than a year after his previous one. The new recording is called Open Hand and it's a studio recording that epitomizes the warm sound and articulate lyrics of this Ashville, North Carolina based artist. Last time around, Wilcox set up in his Airstream trailer and recorded on a road trip or tour he took with his family. On this new recording Wilcox went to California to record with producer Dan Phelps. They recorded computer-free onto analog tape making the CD in one week, with three days for recording and four for overdubs and mix. Wilcox writes in his extensive liner notes on how having the musicians working together and recording the lead vocal with the instrumentation, which he had not done in many years, gave the recording a different, more honest feel. But the instrumentation is also quite understated, with Jon Evans on acoustic and electric bass and James McAlister on drums, plus some additional odds and ends added by producer Phelps. Wilcox says they recorded 17 songs, but 12 ended up on the CD, and they are the kind of first-rate material that has won fans for Wilcox over the years. He considers a range of topics from the need for optimism to romance to religion. It's all served up in his pleasing, easy-going baritone vocals, with acoustic guitar, usually tuned to a lower range, the principal sonic motif. 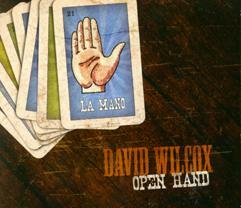 David Wilcox' new CD Open Hand, his fifteenth recording in 20 years, is an all-around fine album by one of the most appealing singer-songwriters on the so-called "new folk" scene. His songs are the kind that will grow on you increasingly with time and reveal themselves more to you with each hearing. And his pleasing vocal style would make almost any song sound good. The CD's production style is tasteful and understated, and the way it was made with most of the instruments recorded live gives Open Hand's performances an intimate, immediate sound. However, for our sonic quality grade, we can give it no better than a B. Perhaps it was the artifact of the analog recording technology -- the old tape machines showing their limitations -- or a conscious decision to do this, but the sound is often dark and especially the drums and percussion seem dull. And the recording is badly over-compressed for a mostly acoustic project, robbing the music of dynamic range and subtlety, presumably in the pursuit of competitive loudness. Though David Wilcox had a couple of major label albums back some 20 years ago, now as he moves toward age 50, he is still relatively unknown outside the folk and coffeehouse world. I don't know if his new independently-released CD will change that much, but it's definitely a most worthwhile album that will hopefully introduce more people to this gifted veteran singer-songwriter.